Bigelow Boulevard has always divided campus, but now it’s dividing community members as well. The finalized street safety plan for Bigelow Boulevard — discussed during a community forum Thursday night — left longtime residents of Oakland questioning whether the changes would improve the commuting experience for all modes of traffic or simply create more congestion. 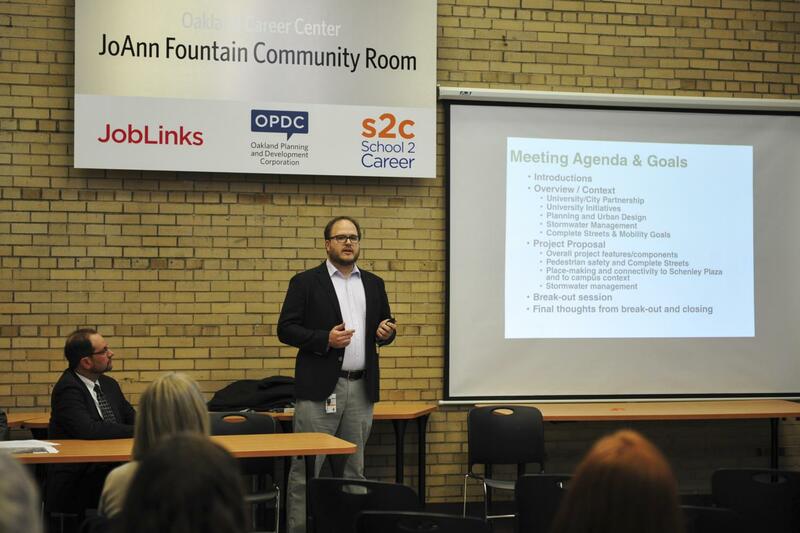 The forum, hosted by the City of Pittsburgh and Pitt, took place in the Oakland Career Center. It featured a visual presentation that took residents through each improvement for Bigelow and showed what the updated street view would look like following the proposed implementation. Justin Miller, transportation planner with the City of Pittsburgh Department of Mobility and Infrastructure, said the design plan came from a partnership between the City of Pittsburgh, the University of Pittsburgh and the Pittsburgh Water and Sewer Authority, who all said the changes should positively impact the community. “It’s a combined effort to take a fresh look at Bigelow Boulevard. Not only in its own context, but the greater Oakland and City context as well,” Miller said. The projected plan includes extended sidewalks along each crosswalk on Forbes and Fifth avenues to ensure the safety of pedestrians from turning traffic, along with connecting bike lanes going along each side of Bigelow, as opposed to the interim bike lanes currently in place. Fred Bonci, the landscape architect of the project, worked directly on the layout of the plan and created the prospective picture that outline the detailed improvements, which includes moving the current pedestrian sidewalk — which falls to the left of the Cathedral of Learning when facing the building — closer to the center of the block. “It’ll improve the safety of the crossing because it’ll be further from cars turning from Fifth Avenue onto Forbes, as well as creating more stacking room in the left-hand turn lanes, which will eliminate congestion onto Fifth,” Bonci said. Bonci also said the sides of the streets will be renovated to add stormwater management basins to remove flooding and drop-off areas to better accommodate the various Oakland shuttle systems. Owen Cooks, Pitt’s assistant vice chancellor for planning, design and construction of facilities management, said the possible improvements to Bigelow have received positive reception from members of the community and added another beneficial component to the University’s master plan — a plan for what the University will be like in the next few decades. The audience at Thursday’s forum spoke about the plan differently. Several Oakland residents said they were concerned the plan didn’t account for traffic congestion issues which often result from Bigelow being one of the main connecting streets between Forbes and Fifth. Marshall Goodwin, an Oakland resident, said the pedestrian crosswalk cutting down the middle of Bigelow currently causes issues with motor traffic backups and will only continue to be a problem with the new plan. In exchange for the many additions contributing to Bigelow’s improvement, a number of parking spaces will be removed from Bigelow and Fifth Avenue as a result. The area around Oakland as of 2016 has 327 parking spots, but the plan will reduce that number to 275. Miller said City findings showed that at peak times, the 327 spots were not all in use, prompting the possible reduction from their traffic studies. “The improvements we want to see unfortunately sometimes come with trade-offs,” Cooks said regarding the parking decrease. The final decision on the complete plan for Bigelow falls into the hands of the Pittsburgh Art Commission, which manages the aesthetic quality of public City spaces,Miller said. It will pass through an initial meeting in January where the commission reviews the plan and finalizes the details before moving to the final meeting in February, when the Art Commission will make its decision.